Australia has minted a gold coin encrusted with rare pink diamonds worth Aus$2.48 million (US$1.8 million) to meet growing demand for high-end collectables from the ultra-rich. The two-kilogram treasure, which depicts a sailing ship, a gold prospector and boab trees found in Western Australia, is considered legal tender and will be sold to the highest bidder. It was "released in response to the distinct increase in demand for exclusive luxury items", said Perth Mint chief executive Richard Hayes said on Tuesday, adding, "The coin showcases rare pink stones handset in the most famed of precious metals, telling the inspirational rags to riches tales of mining for these prized resources." 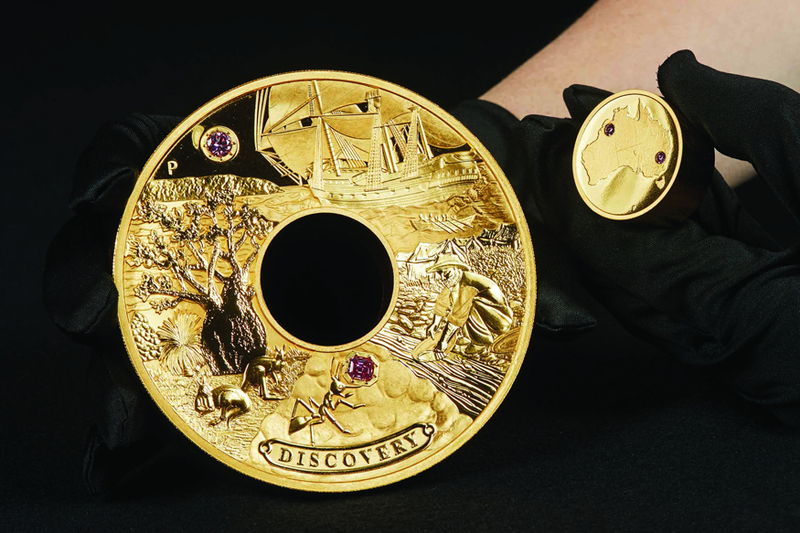 Called "Discovery", it was modelled after the "Holey Dollar", one of Australia's first coins, with a private collector paying Aus$495,000 for one of those in 2013. A key attraction is the four pink diamonds from the renowned Argyle mine in Australia's remote western Kimberley region, including a 1.02-carat emerald cut. Miner Rio Tinto holds a pink diamond sale each year which attracts global interest. Stones can fetch US$1-2 million a carat. As a basic rule of thumb, pink and red diamonds are worth about 50 times more than white diamonds.